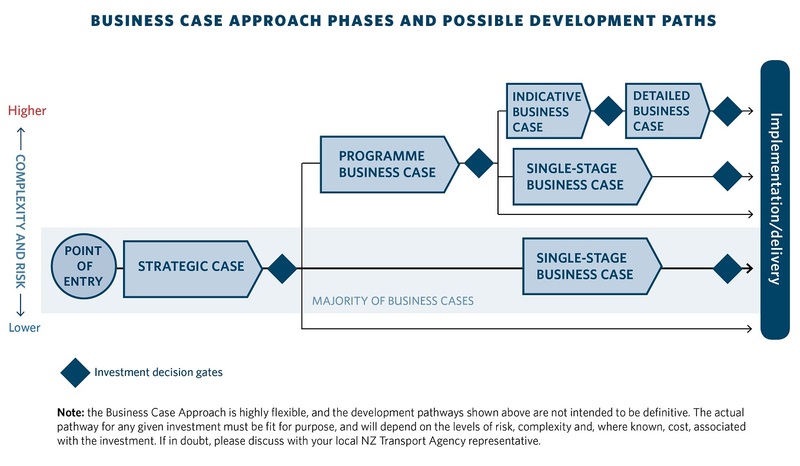 Through the application of the Business Case Approach the NZ Transport Agency aims to give clear and early planning and investment signals to provide stakeholders with investment confidence. A project’s business case is built progressively, and the work that needs to be done and the questions that need to be answered are gathered into phases. Not all projects will progress through all phases – applying fit-for-purpose effort will mean that sometimes phases can be skipped or combined, but the same investment questions will still need to be answered. For business case principles information that is more relevant to non-state highway led activities, see the planning and investment section of the Transport Agency website. The Transport Agency Investment Assessment Framework(external link) is used to assess business cases for support and investment approval. The assessment profile is progressively developed through the business case process and is confirmed in full at the detailed business case. In addition to the application of the Investment Assessment Framework(external link), the Transport Agency also considers the strength of the business case using a framework of 16 questions in arriving at its decision to provide support. The sixteen questions are designed to enable decision-makers to quickly assess the strength of a completed strategic case or business case, and therefore whether or not the proposed investment is worth proceeding with. The solution is likely to be delivered within time and cost expectations. For a single stage, indicative or detailed business case, answer columns 1-4. Is it clear what the problem is that needs to be addressed (both the cause and the effect)? Have the benefits that will result from fixing the problem been adequately defined? Have a sufficient range of strategic alternatives and options been explored (demand, productivity & supply)? Consistent with the strategic alternatives and options, have a reasonable range of project options been analysed? Yes / Maybe / No? Is there evidence to confirm the cause and effect of the problem? Are the benefits of high value to the organisation(s) (furthering its/their objectives)? Is it clear what strategic alternatives and options are proposed and the rationale for their selection? Is the proposed solution specified clearly and fully (all business changes and any assets)? Does the problem need to be address at this time? Will the KPIs that have been specified provide reasonable evidence that the benefits have been delivered? Are the proposed alternatives and options the most effective response to the problem (comprehensive and balanced)? Is the proposed solution the best way to respond to the problem and deliver the expected benefits? Is the problem specific to this investment (or should a broader perspective be taken)? Are the KPIs both measurable and totally attributable to this investment? Are the proposed alternatives and options feasible? Can the solution really be delivered (costs, risks, timeframes, governance, etc)? The framework is intended to be flexible so that in addition to assessing a completed strategic case or business case, it can also be used by business case developers at key decision points in the business case process such as prior to submitting the strategic case to the Client. As well as completing the checklist it is important to consider, on the basis of the overall assessment, how closely what you NEED to know compares to what you DO know of the investment at that particular point in the business case lifecycle. After analysing this investment decision checklist, you should be able to form an opinion based on your own judgement on the strength of the case for change. Formally documents project considerations and sets out an initial case for commencing an investigation into a transport problem/issue or opportunity for approval. The strategic case is the foundation stone for the whole business case process and ensures that the transport planning element of the business case is based on robust logic. Where an in depth understanding of the problems, opportunities and constraints that are proposed in the strategic case are developed and presented through evidence based data, information collection and analysis. A single stage business case (SSBC) merges option identification and detailed analysis in one phase of the business case approach. The indicative business case (IBC) further develops specific activities. It provides a long list to short list of options and it recommends a preferred way forward as part of the short-listed alternatives. The detailed business case (DBC) confirms an activity that comes from the detailed programme (previously called ‘package’) of activities and confirms the overall assessment profile. It includes a more detailed reporting of economic, financial and commercial aspects of the activity built upon the indicative business case. Benefits are set at the beginning of a business case, SMART investment objectives are defined, but this has to continue right through to monitoring after project completion to ensure that the benefits have been achieved.